The Mosher Press > Research and Publications by Philip R. Bishop > Other > The Bigger Strikes Aren’t Over! The Bigger Strikes Aren’t Over! I’ve written before that as one’s collection grows it becomes harder and harder to find new items. This certainly continues to be the case with the Bishop Collection. At a certain juncture there inevitably comes a time of diminishing return. You work hard and even harder to scare up new material but the better items seem to become more elusive and thus less frequently found. Then again you change your focus, subdivide and branch out which keeps things going a little longer, but eventually you realize that the material just isn’t out there any more (you bought it all?). Every once in a while, however, the dam breaks and a torrent–or at least a few good items–comes down the dry bed to the holding tank–the collection. The past couple weeks brought about exactly just such a torrent, albeit so much smaller than in times past but still welcome all the same. A few years before I began collecting all things Mosher in earnest there was a sale in 1984 in a little town called Wyndham, Maine. At the little Wyndham sale a number of boxes of books were purchased by David O’Neal who used to have a book shop in Boston. He purchased and subsequently compiled a list of Mosher books once owned by Mosher’s assistant, Flora MacDonald Lamb. Later, once I was actively collecting, I had found out where Flora Lamb lived and made a journey to see if the family still resided there. I didn’t find members of the family where she used to live, but did manage to locate a niece who was helpful in explaining that her aunt used to live with them and had, in fact, a large bookcase specifically reserved for Mosher Press material. That’s me, a day late and a dollar short. I wish I had been collecting back then, just as I wished I would have had the opportunity to go to the 1948 sale of Mosher’s own library at which the Mosher collector, Norman Strouse, was able to attend and bid, but the material was long dispersed before I arrived on the scene. Fast forward to 2009, and you might guess I was just as surprised as anyone that a small stash of those books were bought by another person other than David O’Neil at the Flora Lamb sale and had been socked away unknown and unseen for decades until they recently surfaced. In early May of this year I came across an on-line description which raised my antennae. It was put there by an antiques dealer of whom I knew very little. A couple items were listed for sale and a few days later even Ian Schoenherr of The Delaware Bibliophiles suspected that this might be something good. Ian contacted me via e-mail alerting me to the books’ appearance including what my eyes had first alighted upon a day before he contacted me: a copy of Leigh Hunt’s A Jar of Honey from Mt Hybla (1848) which the owner described as a “first edition of this scarce work of vivid essays on Italy’s beauty [which] was rebound by Mr. Mosher who owned a publishing company in Portland Maine. 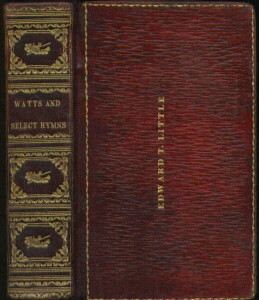 He took the original glazed pictorial board and affixed it to the interior cover.” Now that sounded both intriguing but at the same time a little bit suspicious because I know Mosher’s copy of the book was sold at his 1948 library sale (Catalogue I, entry 222) and nothing in the description indicated it was rebound. Besides, so far as I know Mosher never bound anything himself. Another item also appeared, that being a poetry book with a letter to Mosher loosely inserted. Things were becoming a little richer, so I contacted the seller and asked him if there was more material other than these two items. We’ll call him Jake. He told me the story about how a woman approached him with a box of books she said were in an attic for over 50 years. He bought the books and at some point began to list a couple. I also found out that the books were originally purchased in Wyndham, Maine and as we further discussed things it became evident that they were from the Flora MacDonald Lamb sale. Jake told me I was the first person to even respond to either of his listings and said that there was indeed some more material from that same box. All together there were sixteen items, ten of which wouldn’t be of much interest to me, but the other five were the kind of material that makes one’s ardent and persistent detective sleuthing seem all worthwhile, especially since he was willing to send the whole box load down to Ephrata for my examination (after checking my references of course). A copy of James Thomas Nix’s Mother-Love–Sketches in Prose and Verse (Portland, ME: The Mosher Pres, 1928). It’s one of the few post Mosher printings under Flora Lamb that I lacked, and is in very nice condition. A copy of the first Vest Pocket Series book, Edward FitzGerald’s Rubáiyát of Omar Khayyám (1899) in what appears to be a proto-type of the leather binding eventually adorning some of Mosher’s “Vest Pocket Series” books. The leather is unstamped: no gilt title on the spine, no Frederic Goudy design on the front cover, no Bruce Roger’s caduceus on the back cover, and no top pages edge gilding–all the eventual trademarks of the flexible leather bindings Mosher supplied. Given it’s previous owner, it must have certainly been a mock-up of what the flexible leather bindings could look like sans adornment. A copy of the Japan Paper Company’s exhibition book, Achievement–A Treatise on One of the Factors in the Advancement of the Art of Printing, with Examples (1920) and containing a checklist of the items exhibited by the American Institute of Graphic Arts in the galleries of the National Arts Club (incidentally the same location where I gave a talk on Mosher back on June 14, 2000). Loosely laid in is the calling card of Herbert Farrier, resident manager of the Japan Paper Company in Boston, along with a short letter dated January 3, 1924 in which he adds that “it is very interesting that the students of Oberlin College have bought so many of Mr. Mosher’s books.” The letter is typed on Japan Paper company “Aurelius” watermarked paper. The book is very fine and the connection with Herbert Farrier, or at least the Boston branch of the Japan Paper Company, further confirms my judgment that the papers Mosher used were in all likelihood acquired through the Japan Paper Company who was the dominant paper supplier for fine printing papers in the United States. The book of poetry with the letter I previously mentioned is Frederic Rowland Marvin’s Flowers of Song from Many Lands–Being Short Poems and Detached Verses Gathered from Various Languages and Rendered into English (Troy, New York: Pafraets Book Company, 1902) which was printed by D. B. Updike at The Merrymount Press in Boston. Although 1,000 copies were printed, only sixty-three (this being copy #52) “contain a portrait of the Author on parchment…” that is, printed on real vellum. The book also contains the original prospectus and a one-and-a-half page letter from the author to Mr. Thomas B. Mosher, dated 16 April 1903 in which he states that he was an original subscriber to the “Bibelot” and all the volumes he has thus far acquired in his library are “between Stikeman bindings.” He praises the editor of The Bibelot for his “taste and good judgment exhibited in its selections” and further notes that he’s sending Mosher a copy of his book. What a treat this book and its contents are. The ownership mark of the sea captain Benjamin Mosher. The next book of note is a quarter leather bound copy of pamphlets (about 8 ¾” x 5 ½”) which includes several large octavo pamphlets: Edward Everett‘s A Lecture on the Working Men‘s Party, First Delivered October Sixth, Before the Charlestown Lyceum (Boston: Gray and Brown, 1830), Francis Wayland‘s A Discourse on the Philosophy of Analogy Delivered before the PHI BETA KAPPA Society of Rhode Island, September 7, 1821 (Boston: Hilliard, Gray, Little and Wilkins, 1831), “Mr. Hayne‘s Speech of January 21, 1830” (missing title page to this noted oratorical masterpiece in debate with Daniel Webster on the constitutional right of succession), and the first issue of The Monthly American Journal of Geology and Natural Science (Philadelphia, July 1831). Also included are two other and certainly more important pamphlets from an Americana perspective: Charles Coffin’s History of the Battle of Breed’s Hill, by Major-General William Heath, Henry Lee James Wilkinson and Henry Dearborn (Saco, ME: Printed by William J. Condon, 1831) and a copy of Benjamin Whitman’s The Heroes of the North, or The Battles of Lake Erie, and Champlain. Two Poems (Boston: Barber Badger, 1816) with two plates of “naval action” meaning ships duking it out on the waters with cannon roaring and masts falling. The plates and subject matter of this latter item would have been of fanciful interest to a sea captain which, in fact, is exactly who owned this set of pamphlets. A note in pencil by Thomas Bird Mosher appears on the front endpaper states that this book comes “with bookplate stamped with stencil of my father, (1842).” Indeed, on the very next endpaper there is a stencil marking, in gold, containing the name “B. 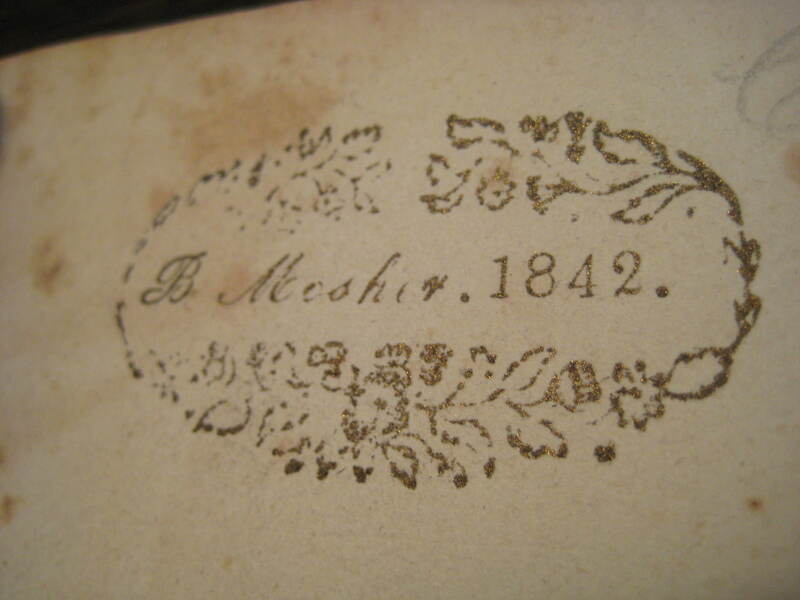 Mosher, 1842.” That’s the ownership mark of the sea captain Benjamin Mosher, the publisher’s father. I have never, ever seen his stenciled ownership mark nor even knew he had one, so it’s a real thrill to welcome this personal item from the family into the Mosher collection, particularly since I already have Captain Mosher’s sailing documents, ship logs, and some of the books he inscribed to his son while on their overseas adventures. Benjamin Mosher was born in 1813, and he was only four months old when the Battle of Lake Erie took place in September 1813. The Victory on Lake Champlain, marking the turning point of the War of 1812, was fought on September 11, 1814 during which “14,000 British myrmidons were defeated and put to flight by 5,000 Yankees and Green-mountain Boys, on the memorable Eleventh of Sep, 1814…” according to an illustrated broadside featured in The Centenary of the Battle of Plattsburgh (1914). This battle was a high mark of a then fledgling U. S. Navy which was able to defeat the world’s strongest naval power. The pamphlet in the book was printed in 1816 at which time Benjamin Mosher was only around three years old. So the pamphlet of these events which the 29 year old Captain Mosher collected and placed his stencil mark of ownership within, chronicles his ownership well after the events and the pamphlet‘s printing. In fact, he was already married to Mary Elizabeth (Merrill) Mosher for three years, and it would be another ten years until little Tom Mosher would be born. Was this a book Tom Mosher had available for reading when he traveled world-wide along with the rest of his family with Capt. Mosher? Was it a book in the Captain’s on-board library? Does it not speak of Captain Mosher’s own reading ability and reverence for his books? These and other such questions are prompted by the book Mosher saved and chronicled with his pencil note. An 1823 hymnal once the property of an earlier Portland resident, Edward Toppan Little. Then yet another book from Mosher’s library surfaced, again with an antiques dealer, this one being from South Portland, and yes, from the same storage as the others with the same background. They were all purchased from the Flora Lamb sale in Wyndham, Maine. And again, Ian Schoenherr contacted me and so did Steve Beare who not only asked if I have seen the book, but also sent through some of his own on-line research as to probably whom it might have belonged. Thank you Steve, and Ian! A subsequent examination of the book confirmed the correctness of Steve’s initial research. Watts, Rev. Isaac. Psalms, Hymns, & Spiritual Songs of the Rev. 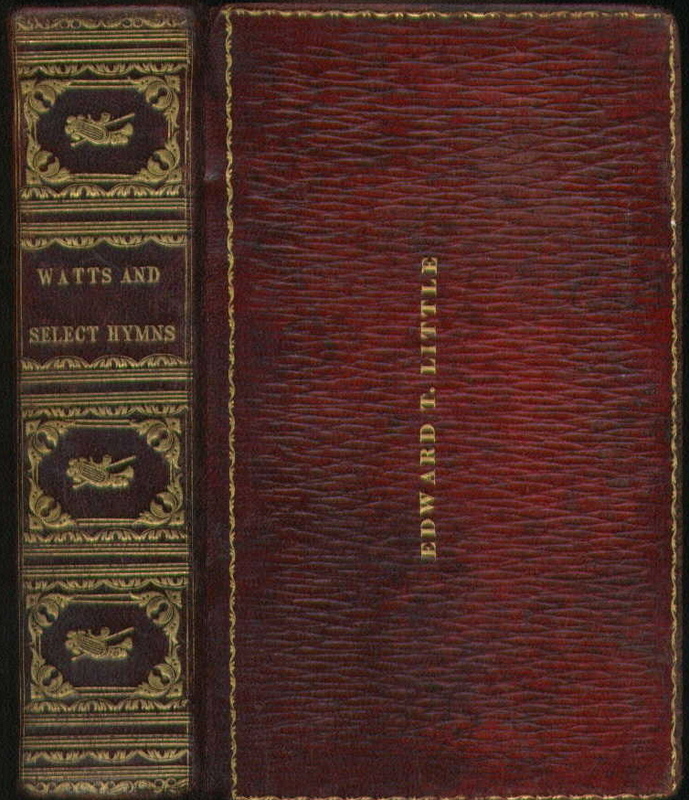 Isaac Watts, D.D. to which are added, Select Hymns from other authors; and Directions for Musical Expression. By Samuel Worcester. Stereotype edition. Boston: Samuel T. Armstrong and Crocker & Brewster, . Edward Toppan Little’s copy in full straight-grain morocco (name on front cover & signed inside); also carrying the armorial bookplate “Library of George T. Little, No. 699.” Signed and dated by Mosher on the third free flyleaf (Oct. 20, 1916) and with his rarely used “I steer by the stars” bookplate on the front pastedown. Little, George Thomas. ed. Genealogical and Family History of the State of Maine. New York: Lewis Historical Publishing Company, 1909, pp. 458-59. See also the tribute to George Little in the Bulletin of the Maine State Library. Vol. V, No. 2. Augusta, ME, October 1915. pp. 2-5). Perhaps some day there will be more to add to the stories behind some of these materials. So overall, not only did coming across this stash lead to some pleasing additions to the collection, but there remains the faint promise of more. A lead turned into a contact turned into an important set of material turned into what may eventually be more good material from the same source. I’m thrilled. It was a long time coming, no matter how small the strike. Gold miners lived on far smaller finds and slimmer hopes.